The Great Lakes State is blessed with varied options when it comes to fishing waters in Michigan. The Great Lakes State is blessed with varied options when it comes to fishing waters. With access to four of the five Great Lakes and Lake St. Clair; abundant natural inland lakes and impounded reservoirs; and a host of rivers and streams, fine fishing is available to anglers throughout the year. 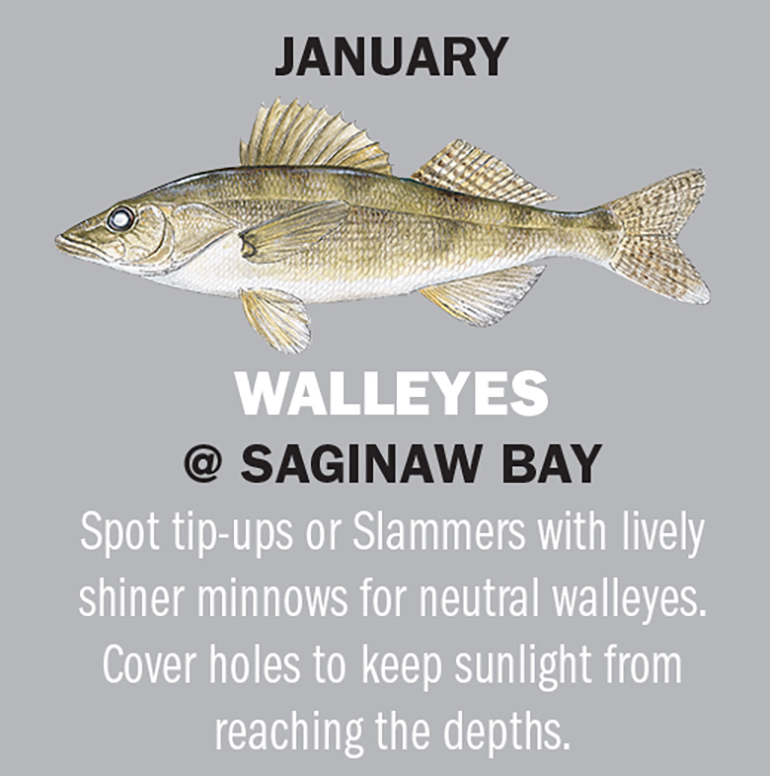 Cold weather locks up Saginaw Bay by mid-January. A hot first-ice bite occurs in depths from 6 to 12 feet all the way from Linwood on the west around to Sebewaing to the east on the inner bay. 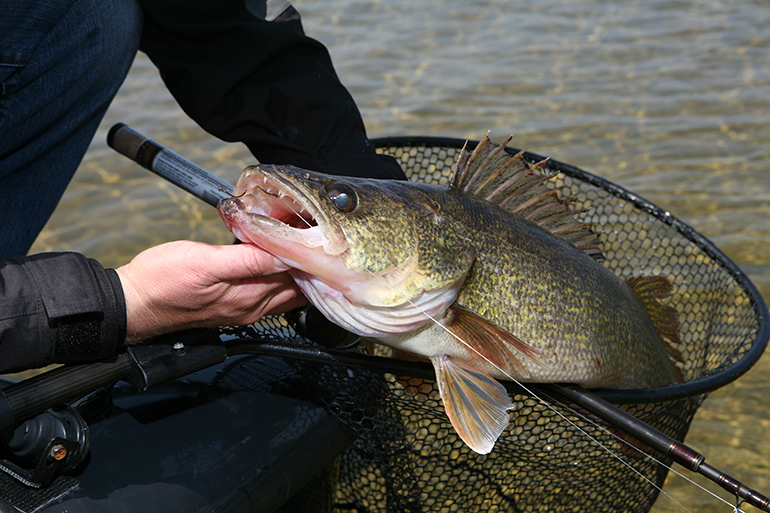 Later in the season, walleyes move deeper to 17 to 24 feet of water. First and last light produce the best action, but on overcast, cloudy days, fishing can be good all day. Jigging is the most productive method. Drill lots of holes and keep moving until you connect with roaming schools. Jigging spoons, like Swedish Pimples, Do-Jiggers and Buck-Shot Rattle Spoons in gold/orange, perch, blue/silver and glow colors are hot when tipped with a minnow or minnow head. Leadhead jigs, Jigging Rapalas and similar lures work, too. A lift-and-drop cadence works best. Most ’eyes will run from 2 to 3 pounds, but larger specimens are starting to show up, and 7- and 8-pounders are possible. For live bait, tackle and fishing reports, contact Frank’s Great Outdoors at (989) 697-5341 or online at franksgreatoutdoors.com. Other Options: Pere Marquette Lake Steelhead: Ice-anglers use Slammer tip-ups to suspend wigglers or spawn bags in front of cruising steelhead. Austin Lake Panfish: Kalamazoo County’s 1,090-acre Austin Lake is famous for largemouths but offers some nice bluegills and crappies for winter anglers. Muskegon Lake is a great place to catch some eating-sized pike, but you also stand a good chance of catching a monster. 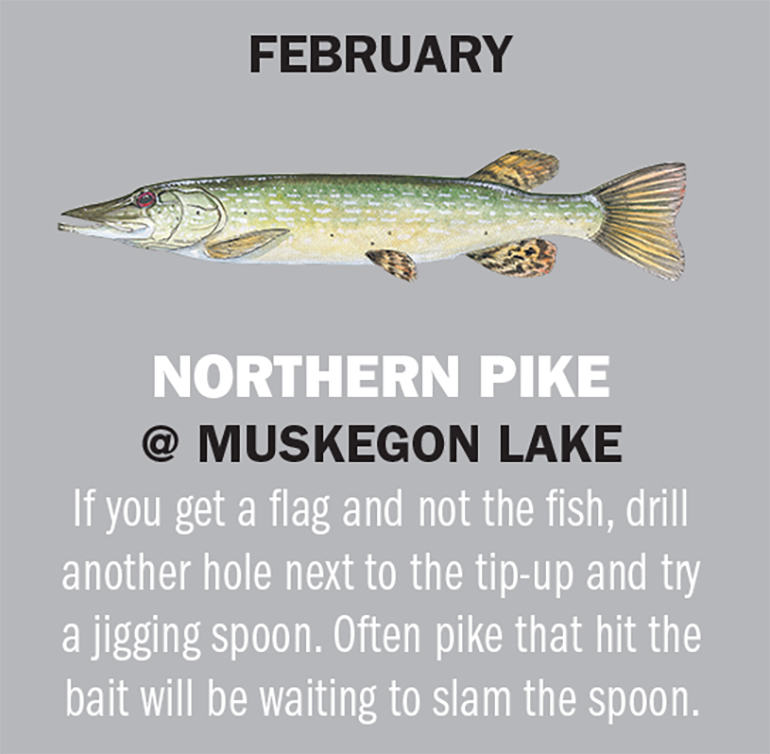 Pike in the 27- to 30-inch range are very common, and 15- to 20-pound northerns, and bigger, are caught every winter. Regular-sized suckers and golden shiners will take the average-sized pike, but for the gators, try jumbo herring. Slammer tip-ups are the tools of choice. Prime locations are off the South Branch of the Muskegon River, off Fisherman’s Landing, Heritage Landing, Second Street and Hartshorn Marina. For information on bait shops and accommodations, contact the Muskegon County Convention & Visitors Bureau at (231) 722-3751 or online at muskegon.org. Other Options: Burt Lake Yellow Perch: Burt Lake has a reputation for producing good catches of winter walleyes, but the perch might be more impressive. Lake Margrethe Bluegills: 1,920-acre Lake Margrethe near Grayling has been hot for good-sized bluegills the past few winters. “Kalkaska County has an abundance of really nice trout lakes that don’t see a lot of fishing pressure, especially in the winter,” says fisheries biologist Mark Tonello. Lakes like Bear, Starvation, Big Twin, Big Guernsey and Blue receive regular plants of browns, rainbows, splake and lake trout. The lakes range from 80 to 300 acres and have good public access. Trout can be caught using a variety of methods. Slammers or tip-ups work well for targeting bottom-hugging lake trout. Splake, browns and rainbows tend to suspend more and can be caught with baits suspended below a bobber or by jigging. Minnows, wigglers and larva all take their share of fish. A flasher or graph is mandatory for locating suspended fish. 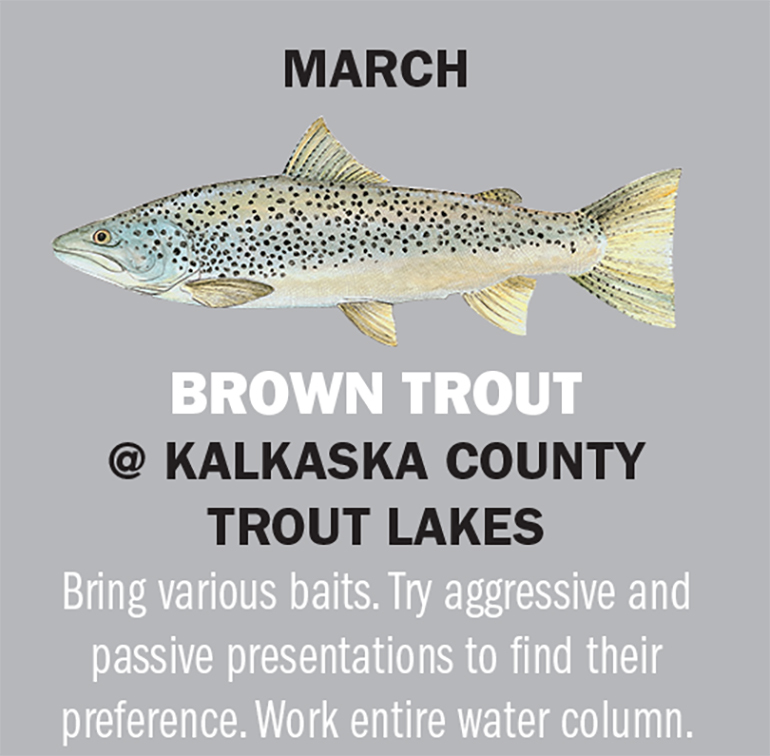 For more information on Kalkaska County trout lakes, contact Jack’s Sport Shop at (231) 258-8892. Other Options: Pine Lake Crappies: Expect frantic ice-out crappie action on Barry County’s 660-acre Pine Lake. Cisco Lakes Chain Potpourri: The Cisco Chain of Lakes offers ice-fishing variety including walleyes, perch and good-sized sunfish, bluegills and crappies, too. 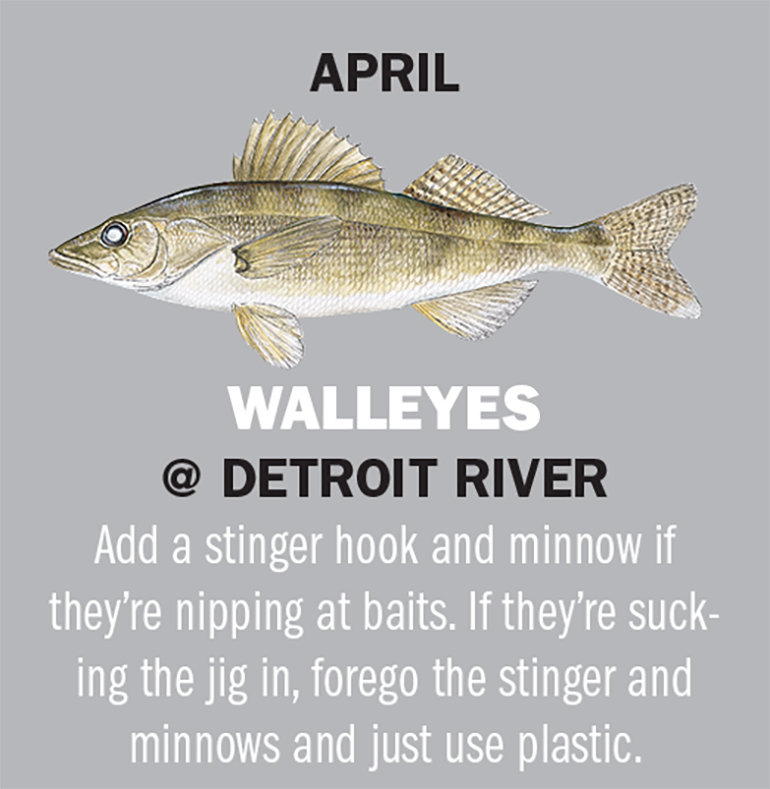 Schools of spawning walleyes begin entering the Detroit River in late March. Sag-belly, pre-spawn females topping 10 pounds are common during the first two weeks of April. Good catches continue through May. Limits are the norm. Vertical jigging with 3/8- to 1-ounce Current Cutter jigs and an Impulse smelt is all you need. Use a trolling motor to slip the current, trying to keep your line as vertical as possible. Hooking the light-biting ’eyes requires concentration, braided line and a sensitive rod. Many fish the Trenton Channel off the Candy Canes, but fish are available throughout the river. Anglers can launch at Elizabeth Park, Erie Metropark and in Wyandotte. You can get bait right at the Wyandotte boat ramp most days. Contact DoubleJay Sportfishing Charters at (517) 715-3620. Other Options: Little Manistee River Steelhead: It’s a tradition for many steelheaders to open the season on the “Little River” on the April 1 opener. Manistee Brown Trout: Manistee has a well-deserved reputation for producing jumbo spring brown trout. A cold spring sees plenty of post-spawn walleyes still in the Tittabawassee come May. Most are males around 1 to 3 pounds, but fish up to 8 pounds are available some years. Slipping the current to vertical jig is a proven tactic. Dragging jigs across shallow flats works, too. Some troll with crankbaits upstream with good success. Good access points are at Center Street, Imerman Park and Wickes Park on the Saginaw River. A good location is just upstream from where the Tittabawassee joins the Saginaw River. Try near West Michigan Park, above the Gratiot Street Bridge and near State Street on the Titt. Expect to catch a bunch of other species, too. For more information, contact the DNR’s Southern Lake Huron Management Unit at 1-989-684-9141. Other Options:Deer Lake Crappies: Slab crappies in Charlevoix County’s Deer Lake can be found in shallow emerging weeds in May. Cass Lake Smallmouths: With Michigan now open to catch-and-release bass fishing, anglers can get a jump on the bass season on Oakland County’s Cass Lake. Although you might be fishing 800 feet of water, the trout are rarely below 20 feet. In-line boards trailing small orange spoons are the ticket when combined with shallow-set divers. Look for bird activity and watch your surface temperature gauge. Troll fast at 3.0 to 3.5 mph to cover water. Most of the ’bows will average between 5 and 12 pounds, but steelies topping 20 pounds are caught every year. The fishing remains hot through the month of July. Other Options: Smoky Lake Smallmouths: Finesse fishing with light line, tubes and crankbaits is good for bass up to four pounds. South Branch of the Au Sable River Brown Trout: Giant Hexagenia mayflies that hatch in late June cause brown trout to go wild on the South Branch. July is the best month to catch a Great Lakes “Grand Slam” out of Ludington. Trollers will find a hodgepodge of lakers, salmon, brown trout and steelhead in the 90- to 150-foot depths. Spoons produce the biggest variety of fish off in-line boards, divers and downriggers. Glow-in-the-dark tape highlighting green, blue and chartreuse spoons score. Try the area out from the Consumer’s Project or north off the state park. Fish 30 to 70 feet down. To book a charter, contact the Ludington Area Charter Boat Association at (800) 927-3470 or online at LudingtonCharterBoats.org. Other Options:Menominee River Small-mouths: Abundant forage and ideal habitat make the mighty Menominee River a great destination for smallmouths. St. Marys Herring: Lake herring begin schooling near De Tour and Lime Island as mayfly hatches bring them to the surface. Big schools of mature kings amass off Manistee beginning in August each year. Chinooks crowd the pier heads all the way to Big Point Sable. Try fishing structure in 100 feet of water early and late in the day. Flashers and flies, plugs and magnum spoons goad the salmon into striking. Spooky salmon tend to shy away from boats and traffic, so try lead core, sinker drops and wire divers to reach them. Mature kings can regularly top the 30-pound mark. Cohos that are headed for Platte Bay are welcome bonus catches. For more information, contact the Manistee County Visitors Bureau at 877-626-4783. Other Options:Fletcher Pond Large-mouths: Hot summer nights are the perfect time for some exciting topwater bassin’ on Fletcher Pond. Black River Harbor Lake Trout: Black River Harbor offers easy access to some hot action for native lake trout during the month of August. Fantastic scenery, solitude and feisty muskies make September one of the best months to fish the Tahquamenon River near McPhee’s Landing. The muskies aren’t huge, but the numbers and the backdrop help make up for the lack of size. Locals soak suckers, cast spinnerbaits or twitch jerkbaits for explosive muskie action. Try bright-colored baits that show up better in the Tahquamenon’s stained water. Prime fishing locations are off the Sage and Hendrie rivers. For more details, be sure to contact the DNR’s Newberry office. You can reach them by phone at (906) 293-5131. Other Options:Manistee River Chinooks: Bronze-colored kings rush into the Big Manistee River in September headed for Tippy Dam. Au Sable River Trout and Bass: Cool nights spur the Au Sable River’s trout, walleye and bass into a feeding frenzy in September between Alcona and Loud dams. The best muskie fishing on Lake St. Clair occurs in late fall when muskies bulk up before winter and begin migrating back towards Michigan waters. Speed trolling with Believers, T-3 Terminators and Wileys behind planer boards and with down rods takes plenty of muskies up to 30 pounds and bigger. Frog-, shad- and sucker-colored lures tend to work best. Casting for muskies is a hoot. Use rubber Bondy Baits, braided line and hold on. Cast the bait as far as you can, allow it to sink and then rip it back to the boat. Contact Miller’s Sport Fishing Charters at 734-395-8820. Other Options:Lac La Belle Muskies: This 1,146-acre lake has a burgeoning muskie population that goes on the prowl as waters cool in October. White Lake Walleyes: Gizzard shad, alewives and native baitfish flushed from dying weeds become prey for walleyes. Leviathan muskies get excited in Gogebic County’s Eel Lake come November. Eel Lake’s small size makes finding muskies easy but catching them difficult. Cast with big spinnerbaits, bucktails or fish a big sucker under a bobber. There is a public access on the south end of the lake. Expect to catch lots of sub-legal muskies with the chance at catching a large trophy. As a general rule, the nastier the weather is, the better the fishing will be. For details, contact the DNR’s Western Lake Superior Management Unit at (906) 353-6651. Other Options:Bond Falls Flowage Muskie: An impoundment of the Ontonagon River, Bond Falls Flowage has a good population of muskies. Lake Independence Walleyes: Marquette County’s Lake Independence serves up some excellent walleye action just before the lake freezes. First ice produces some hot action for big northerns on Houghton County’s Portage Lake. Safe ice is usually present by mid-month, but currents can make conditions iffy. Use caution in your decision-making process. Pike in the 15- to 20-pound range are pretty common on Portage Lake. Ironically, smaller baits often end up taking the biggest pike. Use medium-sized suckers and shiners. Finding scattered weed beds is the key here. Try off US-41 north of Chassell and in the aptly named Pike Bay. For more information, contact the Keweenaw Tourism Council at 906-482-5240 or check them out online at keweenaw.org. Other Options:Houghton Lake Panfish: Shallow 20,000-acre Houghton Lake freezes early and provides some really great first-ice panfish action. Hamlin Lake: Mason County’s Hamlin Lake is very well known for its first-ice bluegill bite.